Kokopax Sun Hat Review & Discount Code! We received a Savannah Baby Sun Hat for Eli to try out from Kokopax. It was the sailor pattern in 12-18 months. The hat lives up to its billing of being the ultimate in sun protection. The hat has a wide all around brim that shades Eli’s face and neck. It is made of a very durable, sturdy 100% cotton canvas. I like the pattern on the fabric, not too “cutesy” at all! The details of this hat is what impressed this mother of four who has been through many a baby sun hat! I like that all seams are covered with a soft twill tape, leaving no rough edges against baby’s sensitive skin. I like that the care tag is on the upper part of the hat leaving no tag hanging out, and no tag rubbing against babies head. These little things when overlooked leave baby taking off the hat. As the mother of very pale, blond haired, light eyed boyz I am always trying to protect their skin and eyes from sun exposure. This hat definitely does the trick! The one feature I am not 100% happy with is the chin strap. The strap is very sturdy and sewn in exceptionally well. The one drawback is the the hook & loop closure is not substantial enough. Even Eli at 10 months can easily pull it apart and off. But once the hat is on and he gets past his “gotta take it off” stage, I am very, very pleased with this product! Check out the Kokopax website to check out the other cool pattern this hat comes in. 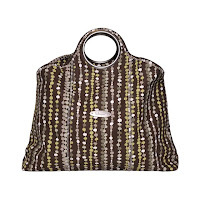 Kokpax also features some great bags in fantastic patterns. They also carry a great framed carrier that is made to be lightweight and comfortable for both parent and baby. Just like the rest of the Kokopax line of products, they come in great funky patterns! If you’d like to purchase something while visiting the Kokpax website, when you checkout be sure to put in the code mommad2009 to receive a 10% discount on any order from www.kokopax.com!